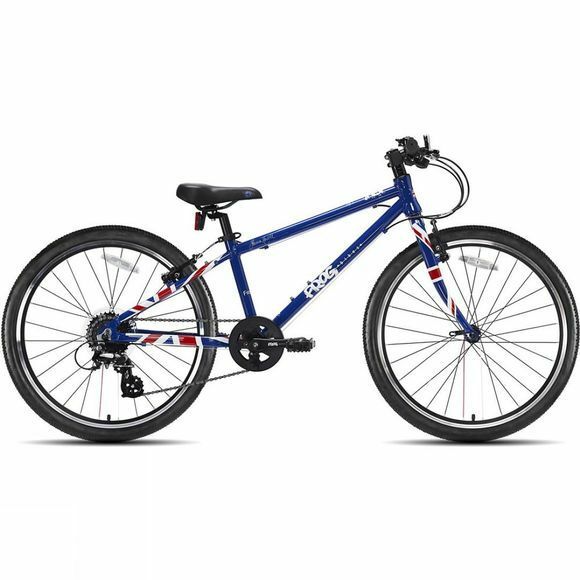 The Frog 62 hybrid bike, a 24 inch kids' bike, is the ideal multi purpose geared bike for 8 or 10 year olds with a minimum inside leg of 62cm. This bike's lightweight but sturdy frame makes is a perfect all rounder kids' bike for any child that wants to cycle in multiple disciplines, from forest trails to riding to school. The bike's research-lead design increases comfort and allows for a more enjoyable ride combined with a quick release seat post for easy height adjustment so all riders can remain comfortable, even as they grow. Tektro brakes with small, easy-reach brake levers allows for better control while decelerating and helps to improve confidence for hesitant riders. The patented Frog cranks increase efficiency and comfort due to a reduced distance between pedals and an 8-speed Shimano easy-change thumb-shifter gears improves safety as the rider's hand remains in the perfect riding position throughout the ride. The bike also comes with reflectors, mudguard and a bell so the rider can be prepared for anything.